What a great picture! Former swim coach and Wabash Athletics Hall of Famer Gail Pebworth just came by with this incredible gift for the Archives. It was sent to her by the family of Albert Otto Deluse, a Beta in the class of 1925. 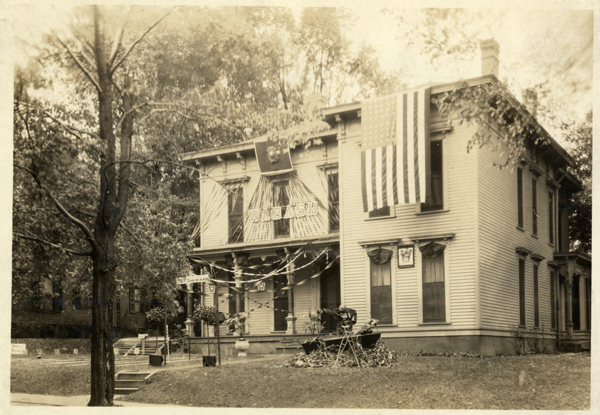 It is a picture of the first Beta House in its Homecoming finery in the early 20’s. This house was the first residence of the fraternity and is in the same location as the Beta house of today. Later in the 1920’s this house was extensively remodeled. The front porch was removed, leaded glass windows were added and the whole house was bricked rendering an “English” effect. Although not dated, this photo is probably from 1921 or 1922. With the donor being a member of the Class of 1925, we might assume it was taken during his time here. Secondly, and perhaps most importantly, there is a replica of a football field including miniature bleachers and yard markers on the left. On the football field there is a scoreboard listing Wabash and the “Aggies” and a quick phone call to SID Brent Harris gave me the answers I needed. Brent could tell me that we played the Michigan State Aggies, as they were then known, from 1907 to 1922. He added, also off the top of his head, that we went 1-5-1 against them. The last time Wabash played this team was in 1922 which would limit the timeframe to just a couple of years. I am delighted with this donation and the chance it gives me to tell a little of the story of this old house! Chances are most members of the Wabash family have heard the story of Ralph Lee Wilson. He was the football player who died in 1910 as a result of injuries he received in the Washington University game in St. Louis. He regained consciousness long enough to ask, “Did Wabash win?” That quote now hangs over the exit of the home locker room in the Allen Center. Each year Tom Bambrey tells this story to the football team. I thought that in this posting I would share a little more information and some pictures connected to it. Ralph Lee Wilson was a talented local boy who, doubtless, had watched the Little Giants playing football for years. He enrolled at Wabash and Coach Harper (later of Notre Dame fame) put this young player in the halfback position. The photo of Wilson in his football uniform is one of the few that we have of him. In this photo we can see that Ralph was a slight fellow. Wabash did win that game 10-0 and that was the last game of that season. All further games were cancelled without dissent. Wilson was popular on campus and immediately calls went out for a permanent memorial to the fallen player. The memorial was created by the same sculptor who did the Thomson (Senior) Bench, the Civil War Roll of Honor on the east face of Center Hall and the bust of President Tuttle. This memorial shows a torch that has been dropped and the plaque hangs on Hollett Stadium yet today. Ralph Lee Wilson is well remembered on this campus and thanks to Tom Bambrey each new team knows his great story. All but our most recent alumni are familiar with Waugh Hall and Thomas Labs, removed to build the new Hays Hall of Science. While memories of Waugh and Thomas linger, I thought it would be fun to share this image of the original Thomas Labs. 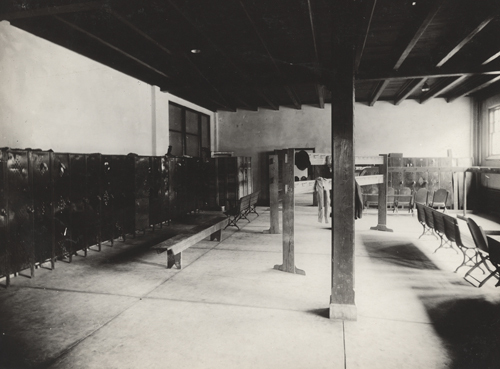 This picture taken by Mason B. Thomas shows us a working laboratory at the turn of the last century. It is here that Mason B. Thomas worked and mentored his students. Professor Thomas is referred to in our history as “the Maker of Men” for the large number of talented students he sent from Wabash to success in graduate schools across the nation. Much as current student researchers are working away this summer in labs under their professors, students of a hundred years ago and more were studying and working with Professor Thomas. Studying with Thomas was a rigorous proposition and, from what I understand, a great honor. Sometimes the work was in his lab, but often teacher and student would go out and do fieldwork as well. Mason B. Thomas’ influence was not limited to the students in his classroom. His lab manuals and syllabi were highly regarded by teachers across the nation. There is another entry in the Wabash magazine of the time which says that his lab manual, Laboratory Manual of Plant Histology was used by the biggest research institutions of that time. In the Archives we also have other publications such as, Directions for Laboratory Work in Botany, Syllabus for Course in Elementary Botany and his Syllabus of Lectures in Fungi. Over the course of his 21 years on the faculty Mason B. Thomas made a lasting and permanent mark on the men of Wabash. It was his former students, the Thomas men, who contributed a great deal of the money to build the Thomas Labs which were connected to Waugh Hall. It was an entirely fitting tribute to their beloved teacher. It was said at his funeral in 1912 that Thomas was just coming into the high point of his teaching and scholarship. A colleague described Thomas in this way, “By nature, his interest in them was such that he warmed their hearts, gave them new hopes, and increased their zeal.” Sounds to me like what we now call student engagement. Clearly Thomas engaged his students and inspired them to share his passion for biology which, by any measure, is the hallmark of a great teacher. The young student pictured above is John Maurice Butler. The Butler Prize was established in 1923 by Mrs. Margaret Butler Snow in honor of her beloved brother, a member of the Class of 1887. The award as announced in September of 1922 was to pay a $150 cash prize to the young man chosen based on “scholarship, personality and attitude towards life.” At the end of the school year, three men were nominated by the faculty and Paul H. Garrett was chosen as the first recipient. The next year Lee Norman “Pete” Thorn – the only 16 letter man (four years, four sports) in our history – was chosen. So to all the Butler Prize winners that have gone before…congratulations!! While working with the yearbook editor who was looking for old pics, I came across these pictures and scanned them. Because they are so neat, I thought I would share these images with some folks who might not see the yearbook. 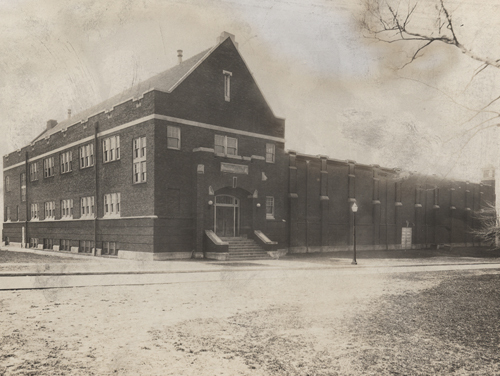 The first picture is of the Armory and Gymnasium shortly after completion – an “as built” photo. It is interesting because once the brick walls went into place following the construction of Goodrich Hall, this view has not been easily available. When this building was completed, it offered the most modern accommodations for athletes. Included in these top drawer features was a practice gymnasium on the top floor of the Amory. This space quickly became the College Chapel as enrollments were up, space was limited and Chapel was still required. In the above photo, we can see the new locker room which was a big hit with the students. During basketball season they now had their own locker room. Prior to this, the college basketball team played at the YMCA downtown. 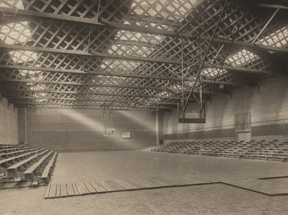 For years the home court for Wabash basketball was shared with the other teams in town. Solidly built, the Armory still serves the students of today via the Writing Center and other offices. Of course the big star of this complex was the gymnasium which we now call Chadwick court. As you can see there was a wooden floor placed over the dirt subfloor with plenty of bleachers for the large home crowds. This space also had amazing natural light thanks to three rows of skylights. Long since covered over, these skylights filled this area with sunshine.